Passengers go through full-body scanners and metal detectors at Denver International Airport on Monday. Atlanta, Georgia (CNN) -- Dennis Gossard is fine with the enhanced security techniques at U.S. airports, and he said security agents are welcome to pat him down all they want if it keeps air travel safe. "They can pat me down for three hours if it's going to save someone's life," the 63-year-old Glendale, California, resident semi-joked Tuesday after flying into Hartsfield-Jackson Atlanta International Airport. Not that security personnel tested his willingness. Gossard did go through a full-body scan at Los Angeles International Airport hours earlier but didn't get an enhanced pat-down. Neither, it seemed, did many people arriving in Atlanta on Tuesday. From the volume of the public outcry as enhanced measures have been rolled out at more airports this month, you might think Americans were getting groped right and left. But the Transportation Security Administration estimates that less than 3 percent of air travelers will receive enhanced pat-downs, which some travelers have called "groping" or worse. Less clear is how many are getting full-body scans, another enhanced measure that has drawn complaints of its own. But of the fliers to whom CNN spoke at Atlanta's airport Tuesday, most said they felt like air travel was business as usual. Of 35 people CNN interviewed at the airport's baggage claim areas in an unscientific survey, 28 went through only metal detectors at the airport they departed. Five underwent body scans, and two had enhanced pat-downs. Nearly all had flown into Atlanta on Tuesday; two were picking up passengers but had flown in the past week. Mary Lou Monaghan, 51, said she was subjected to only metal detectors when she flew from Pittsburgh, Pennsylvania, to Atlanta on Saturday. But she said she'd be OK with submitting to advanced-imaging technology and pat-downs. "If it's what you have to do to be safe, then it's OK. Either that, or you just don't fly. You can drive if you want to drive," Monaghan said. 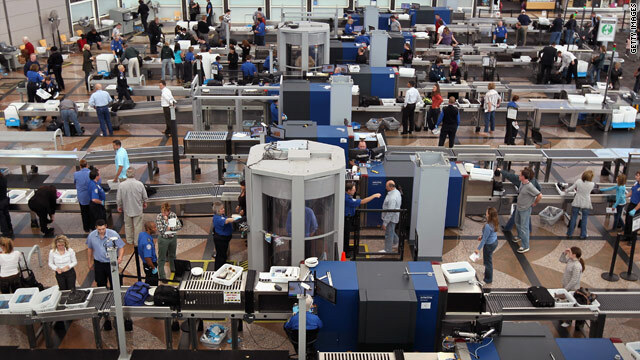 The TSA has said the ramped-up use of full-body scanning and pat-downs is needed to stop nonmetallic threats, including explosives, from getting aboard planes and are meant to head off attacks such as the one allegedly attempted by Umar Farouk AbdulMutallab last Christmas. Authorities allege he had a bomb sewn into his underwear on a flight from the Netherlands to Michigan. About 400 body-scanning machines have been installed at 70 of the country's nearly 450 commercial airports. The TSA said there are nearly 2,200 security lines at checkpoints nationwide. Metal detectors are still the dominant screening technology, although the new scanners have been installed mostly at airports with high passenger volume. The TSA has not estimated what percentage of passengers are likely to receive body scanning, but the number will jump over the next year. By the end of 2011, the agency plans to deploy another 600 scanning machines, bringing the total to 1,000. Pat-downs are used primarily on passengers who set off either the body-scanning machine or metal detectors, and are guaranteed for travelers who opt out of body scanning. Critics of the scanners said they are too invasive -- showing more anatomy to security personnel than some may wish -- and possibly unhealthy, pointing to low doses of radiation used in one of the two technologies used by the machines. Homeland Security Secretary Janet Napolitano has said the radiation levels have been thoroughly tested and are "almost immeasurable, [they're] so small," and the TSA said a traveler is exposed to less radiation from one full-body scan than from two minutes of an airline flight. Critics of the pat-downs say they have become more aggressive and humiliating, coming too close to private areas. Public opinion polls seem to suggest more Americans favor the full-body scans over pat-downs. A Washington Post-ABC News poll released Monday showed 64 percent of respondents supported the use of scanners, with 32 percent opposed. In the same poll, 48 percent said the new pat-down procedures are justified, while 50 percent said they went too far. In a USA Today/Gallup Poll of frequent air travelers released Tuesday, 57 percent said going through a full-body scan doesn't bother them. About 24 percent said it bothered them but didn't make them angry, and 18 percent said it made them angry. Forty-two percent said pat-downs didn't bother them. Waiting for his baggage at Atlanta's airport Tuesday after flying from Houston, Texas, Eric Fitzgerald said he's never been through an airport pat-down or a body scanner. He said he's OK with body scanners in some cases, but not the hand pats. "I think the way they're patting down people is a little too blunt," said Fitzgerald, 31, of Sugar Land, Texas. Jerry Feldkamp, 73, said he just went through a metal detector when he prepared to fly to Atlanta from Fort Lauderdale, Florida. But he doesn't like the idea of body scanning, citing radiation and privacy concerns. "They might go in the back room and start laughing," the Dallas, Texas-area resident said of his concerns about security agents looking at images of his body. "But my main concern is it will give a lot of X-rays to you." Abbey Mayer, a 26-year-old legislative correspondent for a U.S. senator, said she received a body scan Tuesday at Washington's Reagan National Airport. "I don't mind them," she said. "If it's going to protect me from someone hiding something on my airplane, I'm fine with it." As for people's concerns that the images are too revealing? "You can't see my face, so I don't care," she said. Gossard's wife, Geri Gossard, did receive a pat-down at Los Angeles International. The agent asked her if she wanted the hand-pat in a private room (she declined) and told her what she would be doing with her hands before she did it. "To me, it's fine. Just get it over and done with," the 63-year-old teacher said. Her husband, a football coach at Pasadena City College and a teacher, said the public is fickle. "If we get a [terrorist] incident tomorrow, then people will [complain] that people weren't patted down enough," he said. "If you want security, you've got to expect inconveniences." From the volume of the public outcry, you might think air travelers were getting groped right and left. But less than 3 percent will receive pat-downs. Airport security screening is raising an array of questions from health-care professionals. The backlash against passenger pat-downs is gaining steam, with a new viral video further fueling critics of screening procedures. Airport body scans and pat-downs are making traveling a blush-inducing experience, but 80 percent of Americans favor the security measures. Which airports have body scanners? The TSA has 400 body scanning machines installed at airports. Many fliers will bypass the screening method.